Welcome to our weekly series Hotel Tip of The Week. Being on the road every day of the year means we stay at countless hotels along the way. For all the dingy, disappointing budget digs, there are as many budget accommodation gems. We post one hotel tip of the week, every week, of places we feel confident recommending after having tried and tested them ourselves. We had arrived to Suchitoto, El Salvador during a music festival, and while this guaranteed us an eventful time while in town, our only accommodation option the first night was a room at a well-known but sub-par American-owned place. While strolling around town, we came across Villa Balanza restaurant, and as they had received a glowing review in our Footprint guidebook, we decided to sit down here for a bite to eat and ended up booking a room at the hostel for the next night at the same time we paid our restaurant bill. This is not your typical backpacker hostel with restaurant (read: bar) attached. 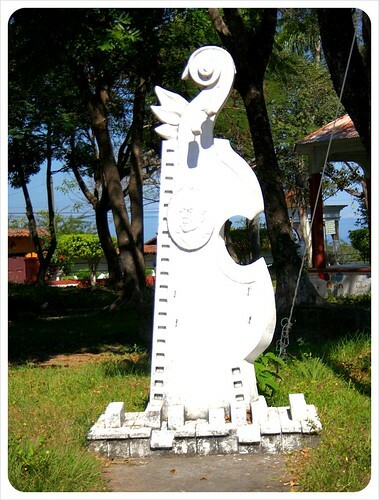 La Barranca is a peaceful hostel set at the bottom of a rather long, steep hill, a five minute walk from the restaurant with views of the major tourist draw, the famous Lake Suchitlan. The way down the hill with luggage is a challenge, even harder is the slog back up after check out, but for those who are reasonably fit (or have a car) the serene setting of the accommodation is more than worth it. The kitchen has beautiful mahogany cabinets, a squeaky clean fridge, all the necessary appliances and is roomy enough to fit a decent sized kitchen table with space to host dinner for a few friends. The living room is equally spacious, with a couch, chairs, a TV, and a computer with internet for those who do not travel with their own laptop. For those who do, including us digital nomads, La Barranca offers free, hi-speed Wi-Fi, which works perfectly everywhere in the main house, fairly well outside in the courtyard, but unfortunately did not reach to the rooms in the second building. As we mentioned, our meal at Villa Balanza hugely influenced our decision to stay at La Barranca, run by the same family. Set just off of a quiet park five minutes from the Suchitoto’s central plaza, this restaurant serves up stylish versions of typical Salvadorian food for just pennies more than the street food vendors in town, while the quality of the food would rival any Latin American restaurant in any major city. The food itself is just one aspect of what Villa Balanza is really setting out to do, which is to define through food, art and history, what it means, and what it has always meant, to be Salvadorian. Hanging over the entryway to Villa Balanza is a large scale (‘Balanza’ means ‘balance’ in Spanish). On one side sits a 750 pound weapon from the armed forces during the fairly recent civil war, on the other, a stack of tortillas. The scale is meant to symbolize the counterbalance of the town’s history in the war with the country’s deeply rooted traditional ‘culture of corn’. Inside the restaurant, the walls are lined with a mix of contemporary oil paintings, centuries’ old photographs and some of the most delicious food in town. This is often a frustrating, if not downright picky, request as so often hotels in countries like the USA and Germany rarely offer free wi-fi at all. 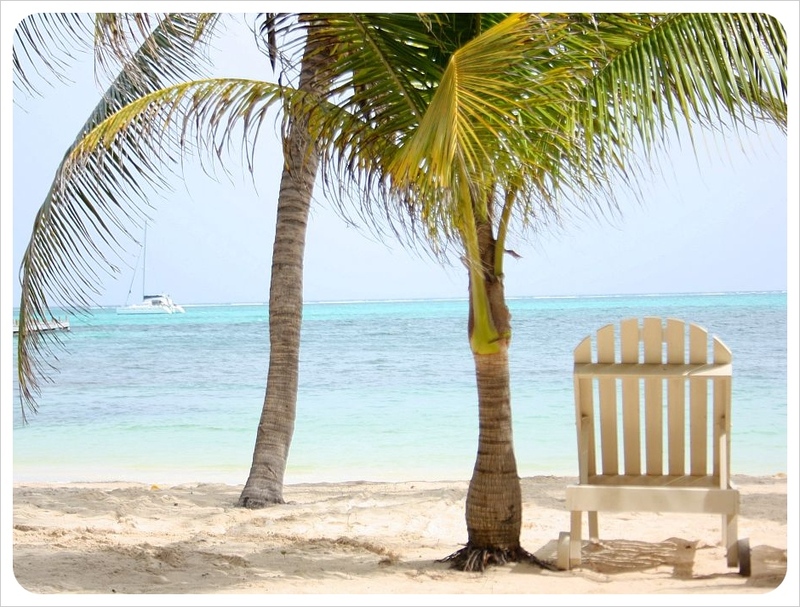 However, for those who spend time travelling in Central America, free wi-fi is a given in almost all hotels, especially those in the budget category. Plus, La Barranca offers free-wi to guests. With a second router, the hostel would have gotten perfect marks from us, as we often work late into the night after a day of sightseeing, and would have preferred working from our room rather than out in the living room until after midnight. Website: www.villabalanzarestaurante.com (ignore the prices on the website as they are completely unrelated to international travelers, and also, the images on this very basic site do the hotel no justice at all!!). 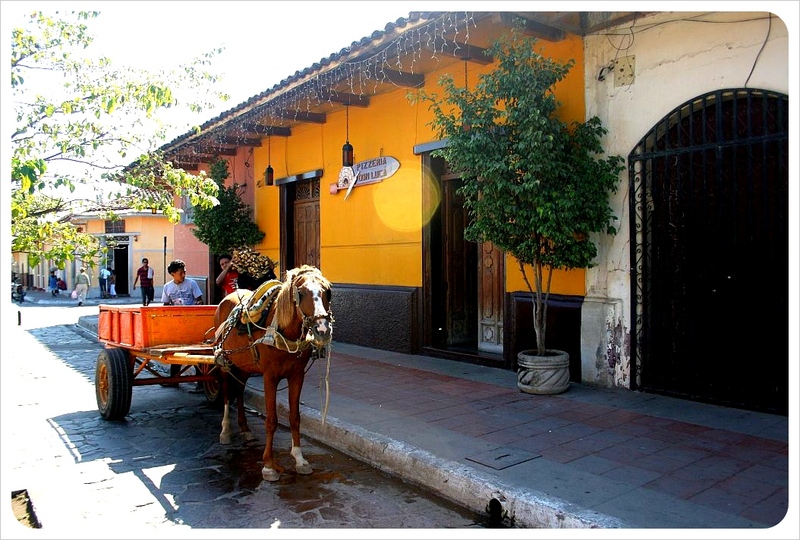 Set along a winding road in a quiet side street, there is no sign marking La Estancia, but almost every cab driver in the city knows the place. If arriving on foot, look out for a purple gate. Popular among Peace Corp volunteers and budget travelers from around the world, La Estancia’s chintzy wood paneling and decades-old furniture feel like a well-worn pair of shoes – the ones that look ugly but are your go-to, reliable pair. The hotel has two dorms and four $30 double rooms. Our room, Room #5, is apparently the best. It had two double beds, a large, clean private bathroom with hot water (real hot water, not an electric shower head), a TV with a DVD player and DVDs, and even a private (small) outdoor patio with a plastic table and chairs. The dorm rooms have six beds and appeared safe and secure for $12, and dorm guests can also enjoy a range of DVDs on the 42-inch flat screen in the living room. Here there are two comfortable couches and a reclining chair, a DVD library and a small library as well with a good selection of books thanks to the many longer-term volunteers who pass through the hotel. A second living room has a TV (no DVD player), two couches and opens up onto a tiny patio space with a fountain. The wi-fi works well in all shared spaces and we were able to get some good work done in between all the DVD watching (oh, and sightseeing, of course). The fully-equipped kitchen, open to guests, is split into two parts – a cramped cooking/washing up space, and an open space with a very clean fridge, 8-seat round table, and plenty of dishes and silverware. Breakfast is served out here, although it leaves much to be desired (see Room for Improvement below). Free coffee is available all day though, and cooking for yourself is no issue at all, thanks to the two mega-supermarkets located at the Metrocentro just five minutes’ walking distance from the hotel. 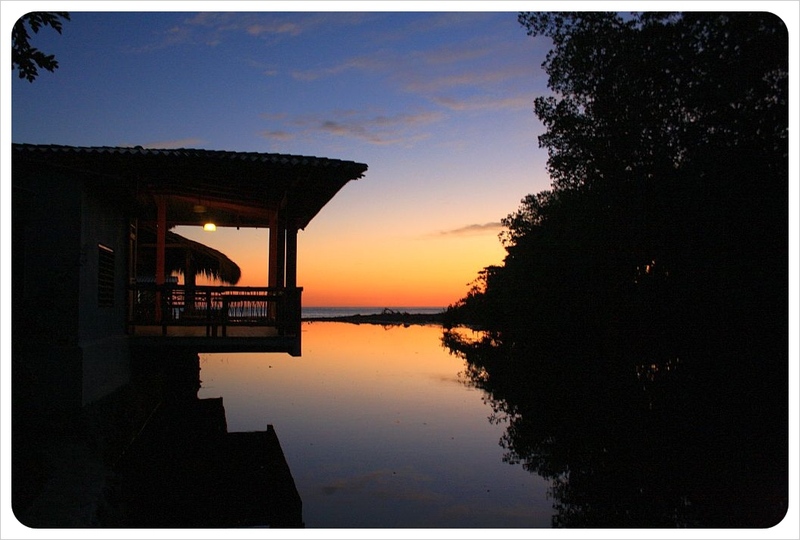 In fact, it is the hotel’s location that we found to be the best aspect of our stay at La Estancia. La Estancia is five minutes from the Metrocentro Mall on Boulevard de Heroes, which is a North American style mega mall with supermarkets, restaurants, coffee shops, a 12 theater Cineplex and a healthy range of shopping options from high fashion to basic needs. Depending on how long you have been on the road, even those who like to avoid such mall monstrosities can appreciate the chance to run every conceivable errand around the corner from their hotel. The Metrocentro is also a major transportation hub. Almost every city bus line and taxis pass by here, which makes getting home from a day of exploring the city that much easier. Breakfast is included in the price, but it is prepared grudgingly by a member of the cleaning staff. It just did not taste good. A toaster oven and a loaf of white bread is made available for anyone to prepare their own toast – certainly a wiser option. El Salvador’s capital city of San Salvador, more specifically the swanky Zona Rosa district, has attracted several four and five star international hotel chains which jut enthusiastically out of an otherwise muted city skyline. Far from this glitz and glamour, visitors on a budget might have a hard time finding affordable, yet comfortable accommodation in the capital. La Estancia may not sparkle, but in terms of practicality, this budget hotel is hard to beat. After spending fourteen days in El Salvador, here are 14 things, in no particular order, we found out we love about the country, one for each day. 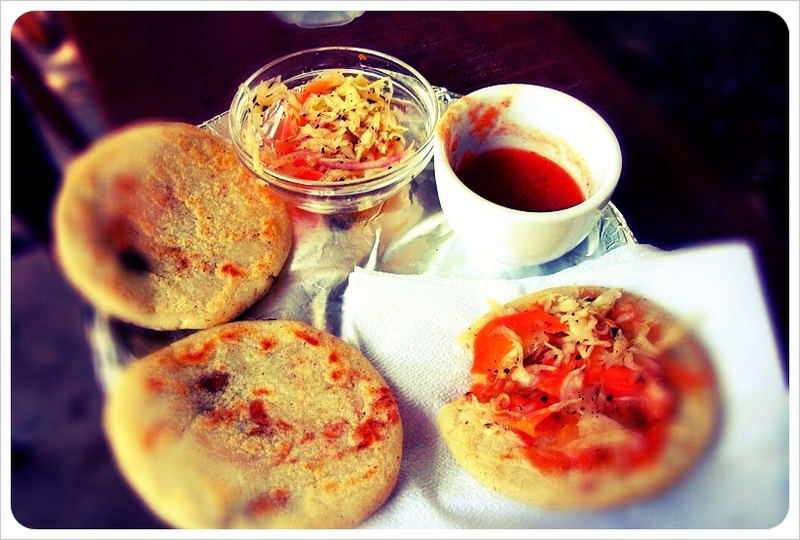 Pupusas – We could eat these lovely little things morning, noon and night. Sunsets over the Pacific – beautiful every single day we were there. 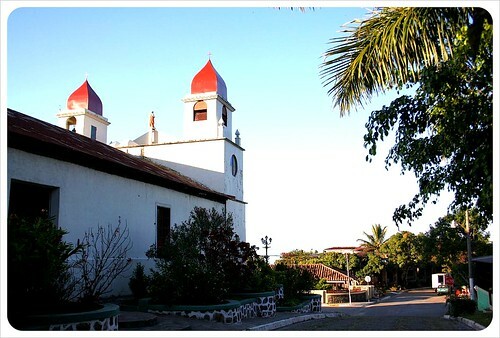 Suchitoto –With loads of culture and located on the shores of lake Suchitlan, the cute colonial town is equally popular with foreign tourists and weekenders from San Salvador. 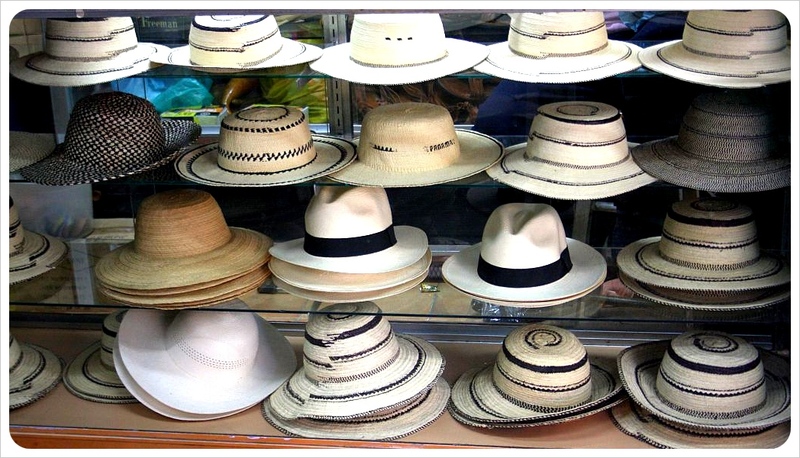 Salvadorians – don’t let the number of people packing pistols throw you off – the good-spirited people of El Salvador are as kind and helpful as they are lively. There might be rotten apples in every bunch, but during our time in the country the number of times people went above and beyond to help us is countless. The Beer – El Salvador is hot, and they serve up their beer cold. 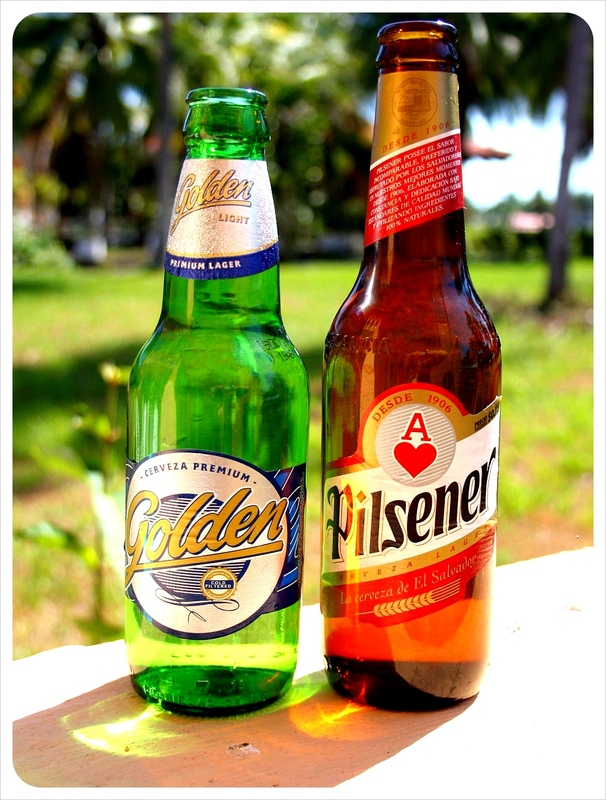 There is nothing like a 5 o’clock Golden or Pilsener in El Salvador. Villa Balanza in Suchitoto – worth a visit for a cheap, very well-prepared lunch or a great hotel stay with wi-fi, lake views and peace and quiet. Escencia Nativa – although we were not fans of the beaches of El Salvador, Escencia Nativa hostel in the beachside spot of El Zonte does everything right. Owner Alex, a former champion surfer turned hostel owner and native of El Salvador, has constructed a perfect chill out spot which works as well for surfers after a hard day on the waves, as well as for non-surfers who spend the day relaxing at the pool and scarfing down the delicious food and drink. 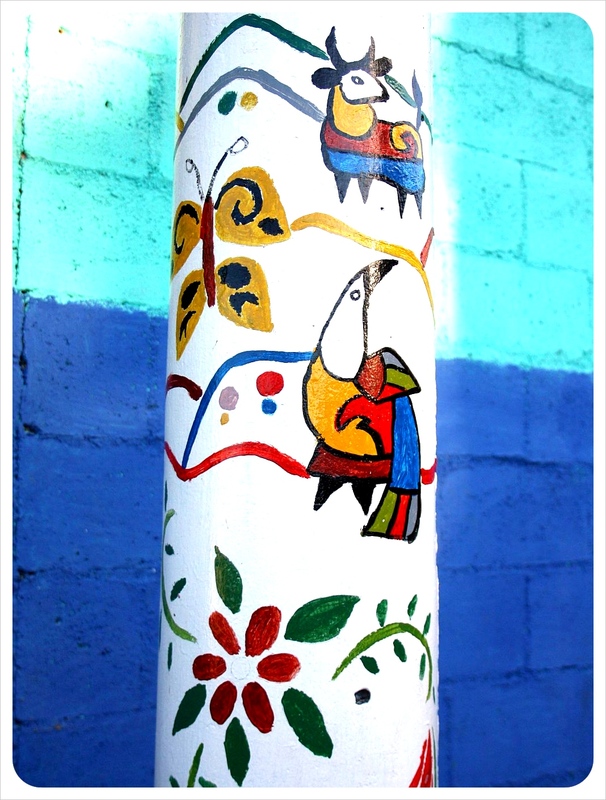 The Painted Phone Poles – Artistic spirit is very much alive in El Salvador, and, more than in most other Central American countries, there is plenty of street art, murals, and inspiring graffiti. 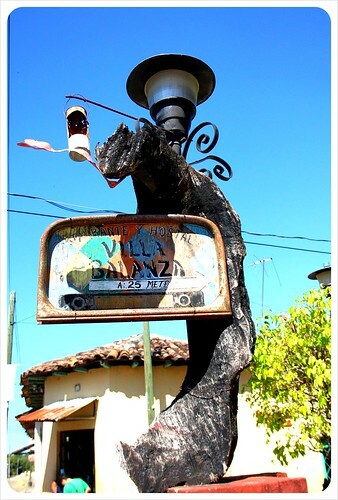 In the towns of Ataco, Alegria, and Suchitoto, the phone and electricity poles are all painted on the bottom, individually designed by different artists and displaying many positive messages and histories. 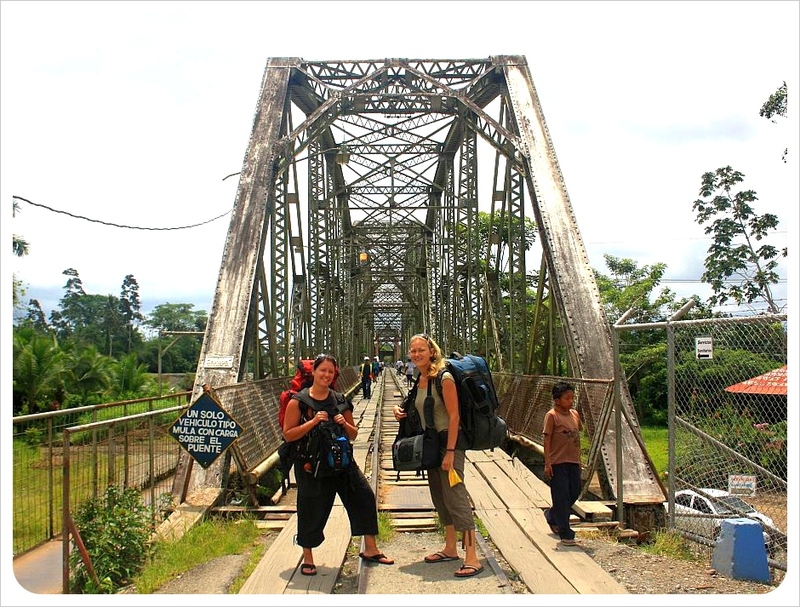 Entre Piedras hostel in Alegria – read here for a full review. The vendors on chicken buses – Travel long enough through Latin America and you come to know: where there is a ‘chicken bus’ there are people selling food. In El Salvador, the entire bus+food vendor process is taken to a whole new level. Rather than one or two, there are up to 15 vendors on one bus at any given time. Regardless whether every single vendor on the bus is selling the same thing, each individual makes her/himself heard while selling pupusas, fish, or entire chicken meals with fries on plates wrapped in plastic. But it’s not just food. One day, we bought toothbrushes for a great deal on the bus. The next day, for half the price, we could have gotten the two toothbrushes with a pack of three pens. Why didn’t we wait? Frozens – similar to licuados (or fruit+ water shakes), in the hot, hot sun of El Salvador, the Frozen is a very large, very frozen version and is delicious. The seven waterfalls around Juayua – these waterfalls are located just past the popular tourist town of Juayua, and tours can be organised in town. Jason and Aracely, the TwoBackpackers, also explored the 7 waterfalls when they came through El Salvador and have great video footage on their website. We might love watching surfers catch waves as the sun sets, but we GlobetrotterGirls don’t surf. 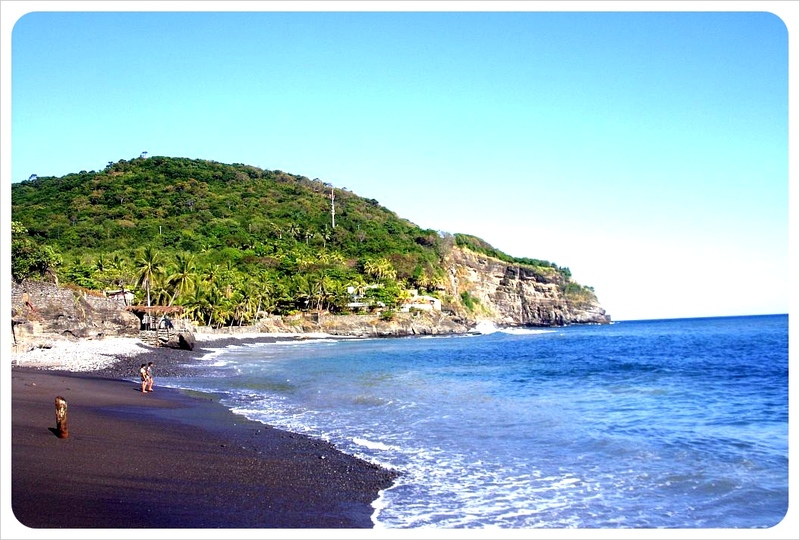 Since the beaches of El Salvador are great for surfing but rocky and not great for swimming, this was not the part of the country that grabbed our attention, nor were the big cities or the landscapes. The most enjoyable part of El Salvador was the smaller towns and villages throughout the country with their peaceful mornings, friendly locals and artistic inspiration. We’ve already outlined the towns along the ‘Ruta de las Flores’, El Salvador’s flower route, but the two towns that have our hearts are Suchitoto and Alegria. 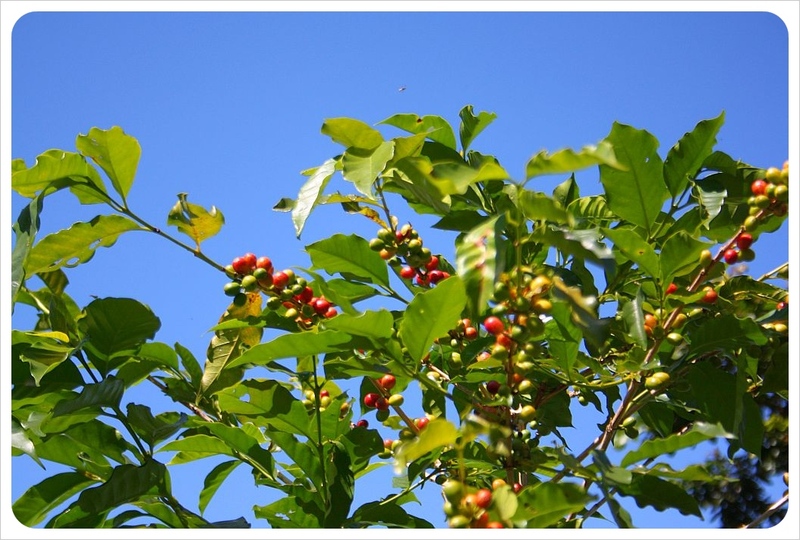 Alegria is a small mountain village in the Usulutlan region, surrounded by El Salvador’s highest mountains, coffee farms, and several volcanoes. The village itself is as sleepy as a mountain village can only get. When the bus lets you out on the main square, you might not see a single soul out in the midday sun, except for the two ladies making pupusas right on the square. 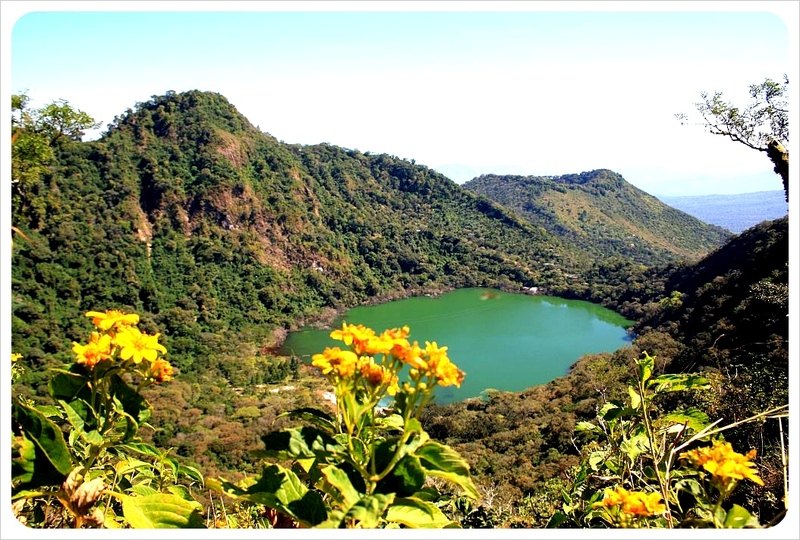 Alegria is famous for is the Laguna de Alegria, a crater lake two kilometers outside of town, which you can visit by yourself or take a guided hike like we did. There are only three or four accommodation options, and you may run in to one or two foreigners during your time in town, as this village is truly off the beaten path. 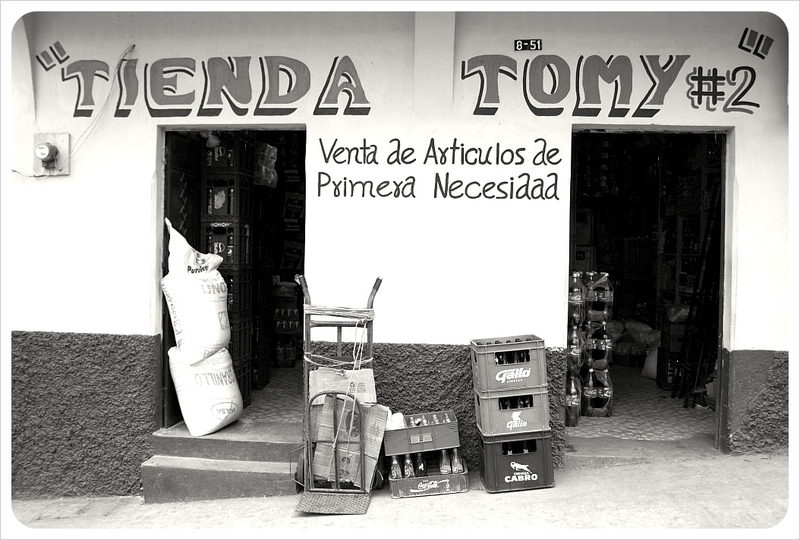 Other than that, there is not an awful lot to do in Alegria. You can sit on the main plaza and chat with the locals, eat your way through various pupuserias in the village, check out the views at the spot of the 100 Steps. 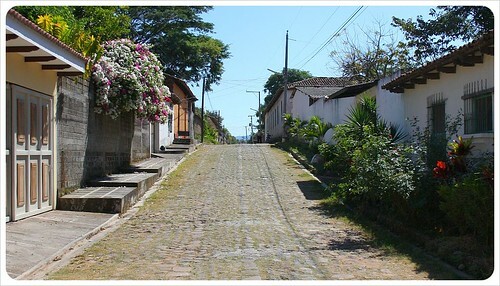 To work off all the pupusas, walk up and down these 100 steps, or even jog them, like some of the locals do. 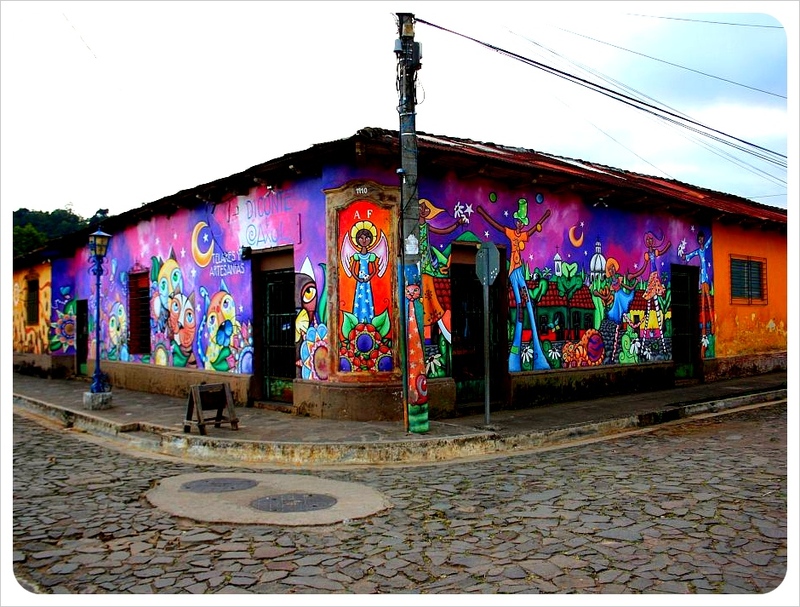 Otherwise, tour the cobblestone streets to admire the street art and murals that color the town. If you are looking for a place with nightlife, museums and entertainment, Alegria might not be the right place for you, but if you are looking to hang back for a few days, relax, take in some El Salvadoran village life and enjoy the fresh mountain air in the highest village in the country, then Alegria is this is the most ‘authentic’ place you can find. ‘Entre Piedras’ in our Hotel Tip of the Week, but we are not getting tired of mentioning again that it also contributed significantly to the memorable time we had in Alegria ($20.00 for a double room, free wi-fi). 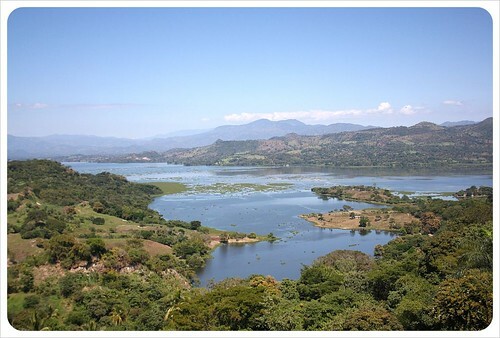 At a quick hour’s ride north of San Salvador, Suchitoto is the top mountain getaway pick for tourists and locals alike. Although the town contends with Alegria for the title of ‘El Salvador’s most picturesque village’ we think Suchitoto wins hands down. 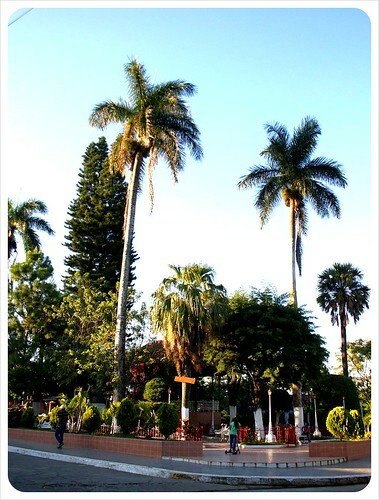 A colonial town with cobblestone streets, a large, bright central square, well-preserved colonial houses and trees and flowers throughout town, Suchitoto is also home to buzzing restaurants, cafes, bars and pupuserias. 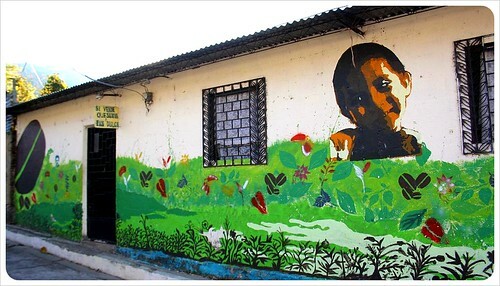 During El Salvador’s civil war, artists fled the capital and made Suchitoto home, an inspiring influence which can still be felt throughout the town. Alternative artists and stylish residents browse through quirky shops and art galleries and the smaller Parque San Martin is decorated with sculptures. 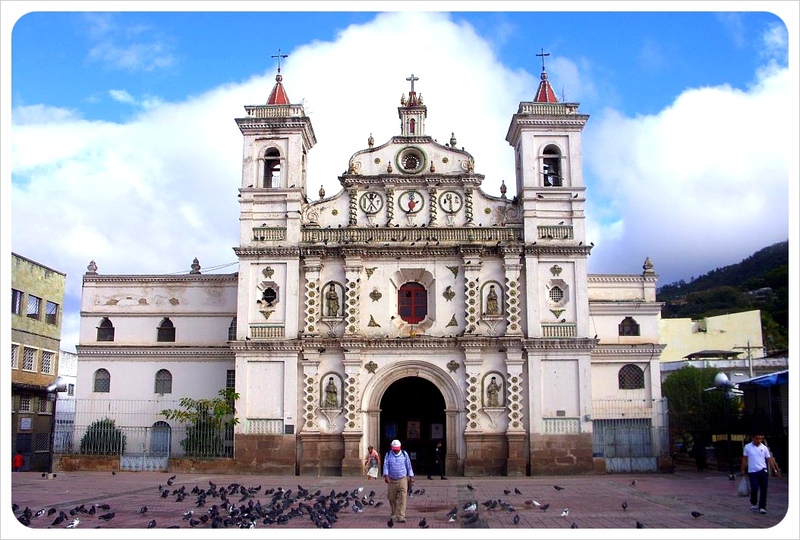 The creativity can even been seen on the iconic Iglesia Santa Lucia cathedral in central park, which has a stunning white façade, six columns and three towers on top which are decorated with….dinner plates! We love how creative and economical this decoration choice was. There are several festivals throughout the year, when live music on the central square can be enjoyed while having a drink or a coffee in the many cafes and restaurants that line the Plaza. 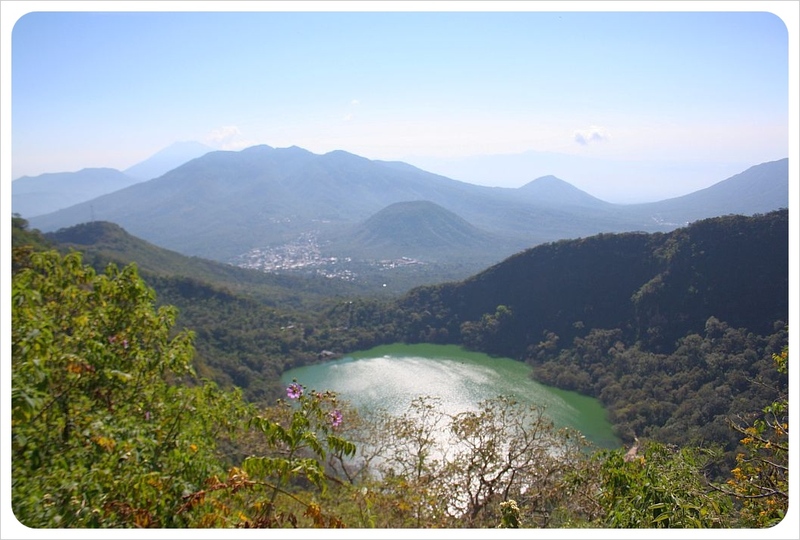 You will see Lake Suchitatlan from town, and this popular weekend destination is easy to reach from town by heading down 3 Avenida Sur all the way down the hill either on foot or by frequent local bus ($0.45) The lake can be crossed by boat or ferry, and is also the starting point of the adventurous hike to the Los Tercios waterfall (a bit too adventurous for us). For equally thrilling but less risky adventure, join the people who zipline across the lake. How to get there:Bus No 129 from San Salvador (Terminal de Oriente) goes directly and very frequently. Where to stay: There is a cheap hostel often recommended for $10.00 for a double room (6 Calle de Oriente), but it was run down and we wouldn’t recommend it. We opted for the more expensive but also much more comfortable Villa Balanza ($20.00 for a double room, wi-fi, kitchen, TV, lake views), which also has a fantastic restaurant which is worth a visit for affordable typical food and creative décor. This is our first article in a new weekly series Hotel Tip of The Week. Being on the road every day of the year means we stay at countless hotels along the way. For all the dingy, disappointing budget digs, there are as many budget accommodation gems. We’ll be posting one hotel tip of the week, every week, of places we feel confident recommending after having tried and tested them ourselves. 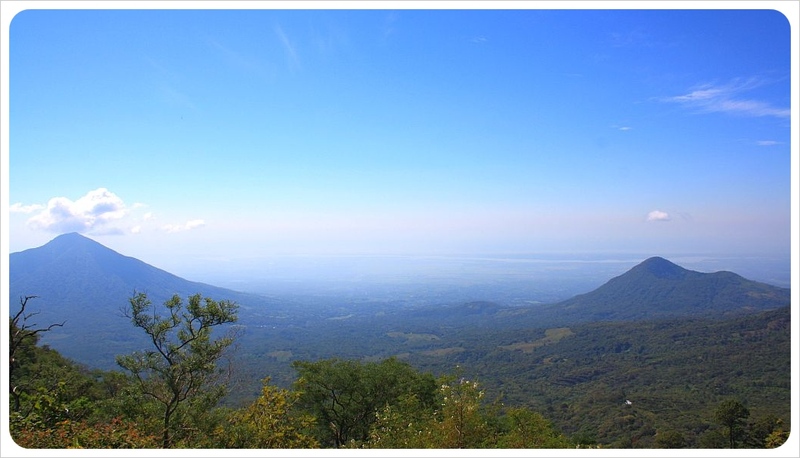 Entre Piedras hostel is set in a small mountain town of Alegria in El Salvador. 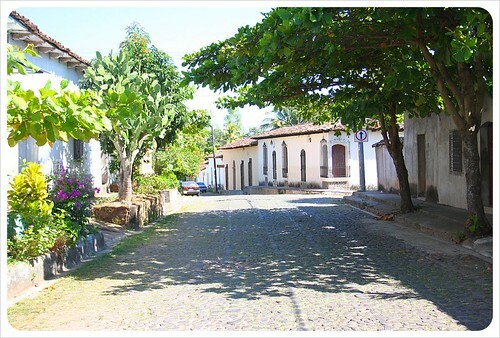 Like most budget hotels in Alegria, Entre Piedras is a converted family house. What makes the hotel stand out is the way it brings guests the perfect balance of an at-home feeling with all the hotel amenities and services to feel like a valued guest. You won’t find Entre Piedras in any guidebooks yet either, as this near-new hostel opened only at the end of 2009. Unlike many hostels, Entre Piedras is similar to a cozy bed and breakfast in size and feel. There are only three rooms available – one dorm of 6 beds, one room with a bunk bed for two (both with shared bath), and one master suite with a sprawling double bed and private bathroom. Roberto, who manages the day-to-day business at Entre Piedras, goes above and beyond for his guests. Up early writing one morning, I had yet to have breakfast, and Roberto brought me a new fruit to try – a zapote, something I would never have tried but am sure glad I did. 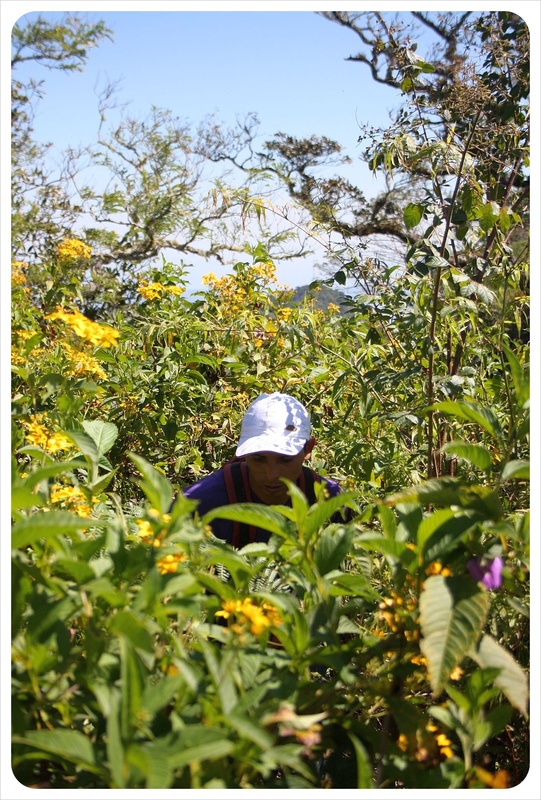 He also told us about a hike around the Laguna de Alegria, and even joined the guide and us on our hike, teaching us about local coffee history and coffee along the way. The restaurant has an excellent, if small, menu of international food. Breakfasts for US$3 hit the spot, and this is the only restaurant in town which offers an alternative to comida tipica, or typical food. The public rooms inside are decorated as though you are simply staying in someone’s house, but the knick knacks, antique technology gadgets, stack of 50s magazines and very antique black and white photos are so well curated that this is clearly a subtly constructed living museum of sorts. At this hotel there are two features that bring Entre Piedras a head above the rest. The first one is the excellent coffee. Roberto is a true coffee lover himself and has a top of the line coffee bar machine. Indulge in the best americanos, cappuccinos and lattes in El Salvador. The second absolute stand out feature is the entire family’s engagement in quality tourism development in El Salvador and Central America. In addition to owning the two hostels Entre Piedras and La Casa Mia, the family are a part of ‘Red de Posadas Rurales’ a network of rural hostels and hotels through Central America that are of high quality, eco-friendly and engaged in their community. Roberto himself clearly has good relationships with hostel owners throughout El Salvador and is working together with Alex, the owner of the (also excellent) hostel Escencia Nativa in El Zonte, on a website called El Salvador By Bus. This website will map out the best and easiest routes for getting around the country by local ‘chicken’ bus and will include prices, schedules and journey times. Tourism infrastructure in El Salvador is rough at best and such assistance is sorely needed and much appreciated. For the digital nomads & travel bloggers out there Entre Piedras offers free fast reliable wi-fi, and the hostel is peaceful enough to get work done. Working at one of the living room or dining room tables inside also feels like working from home, which after spending days in cafes and restaurants, is a really comfortable experience. 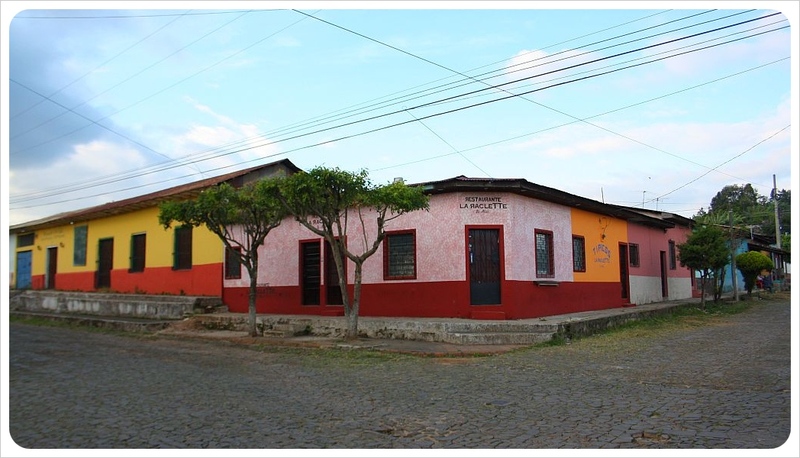 At the time of our visit at the end of 2010, Entre Piedras was the only hostel with free wi-fi in Alegria. The shared bathrooms are clean and well-maintained, but are located in the back of the property. Guests of the hotel have to walk through the back end of the outdoor restaurant with wet hair and shower products in hand, which breaks up the enjoyable outdoor atmosphere of the restaurant and is a tad bit uncomfortable for guests. This shouldn’t affect your decision whether or not to stay at Entre Piedras, which we can whole-heartedly recommend should you find yourself in Alegria. 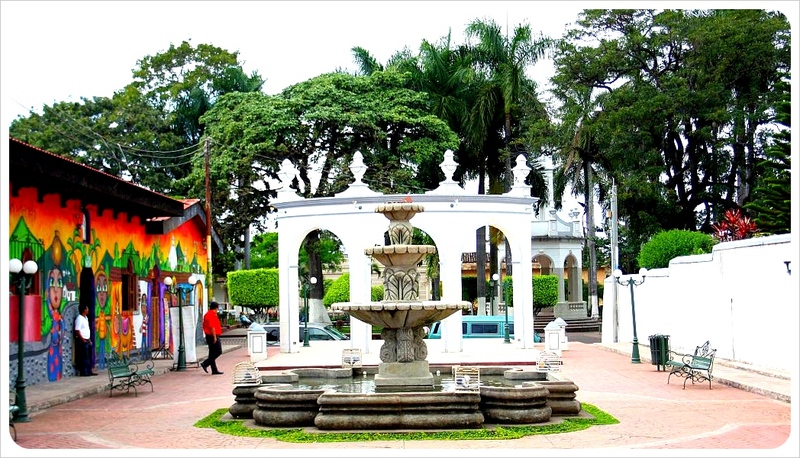 Location: Northeast corner of central park in Alegria, Usulutan, El Salvador. The Day We Became Mountaineers…well, kind of. After debating whether or not to wear hiking shoes for what we thought was a simple day hike to a laguna, Dani and I headed out front of our hostel in Alegria, El Salvador to meet our guide for the day, Walter. This bright, energetic young man with a twinkle in his eye stopped sharpening his machete long enough to shake our hands and exchange initial pleasantries, in spite of his potential weapon. 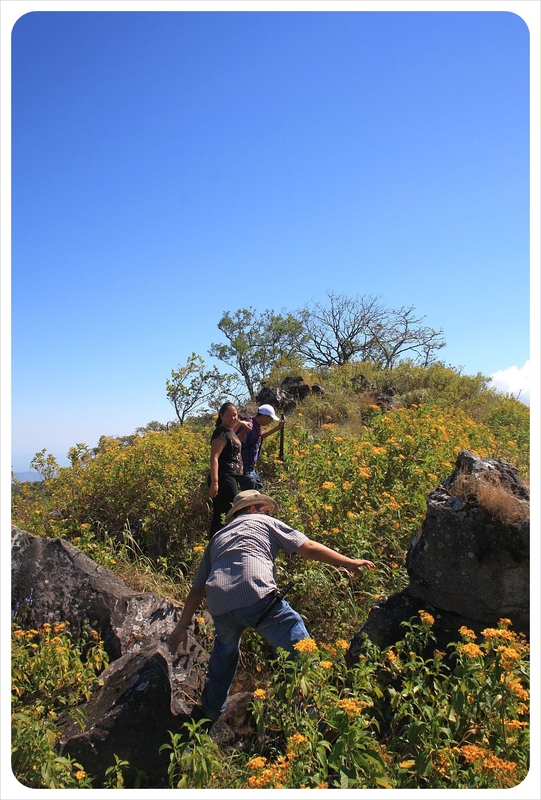 We were very excited for this hike, which was offered to us by Roberto, the friendly owner of Entre Piedras hostel in the small mountain town of Alegria. After a few rather disappointing days on El Salvador’s Costa del Sol, we had finally arrived to the village which our trusty guidebook had lauded as one of the most picturesque in the country, and home to the Alegria Volcano and Crater Lake just 2km outside of town. At breakfast the day before, Roberto described a hike that would lead us through lush coffee plantations, high up onto the volcano ridge surrounding the laguna, and after circling the crater and catching spectacular views of nearby volcanoes, mountains and across all the way to the Pacific Coast, would lead us down into the sulfur lake with hot springs. 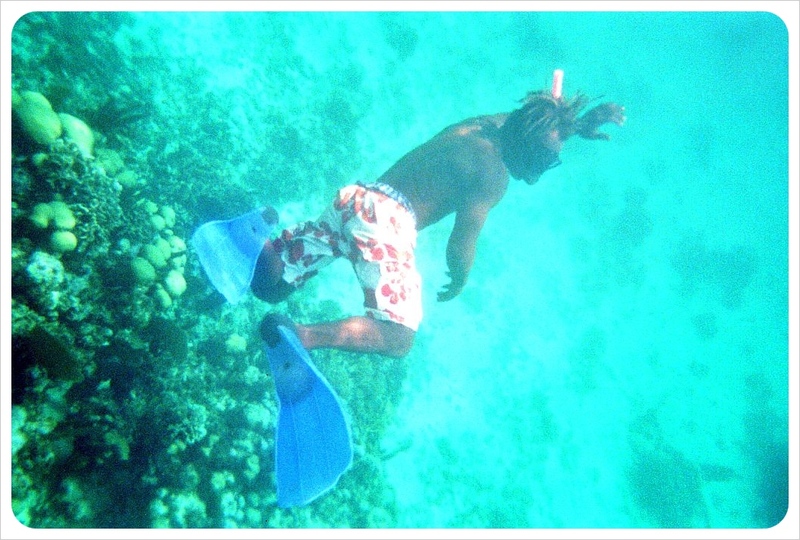 The days we spent on the beaches had been particularly lazy, and with a great desire to get active, Roberto had us at the word ‘hike’. This is how we found ourselves at 8am with Walter, and Roberto who decided to tag along, wondering about our judgment to head into the El Salvadorian wilderness with two men and a machete. Roberto had a fairly sharp knife clipped to his belt, too. ‘For fruits we find on the way,’ he explained. ‘And the machete?’ Somehow, this question never escaped my tongue, as Dani and I simultaneously considered being nervous for about half a minute, but instead decided to trust our gut – and Walter’s contagious grin. We set off through the streets to the base of the mountain. The start was a steep 45 minute uphill hike through coffee plantations, and we panted like dogs through some interesting conversations about the coffee industry in El Salvador. Once at the top, we were rewarded by terrific views, as promised, and Walter showed us the route we would take around the entire crater top then down to the lake. Looking at the emerald green sulfur lake below and enjoying the breeze, the remaining walk didn’t seem too hard. We continued easily along well worn paths, arriving after another 20 minutes to a guard station on top of a small hill. 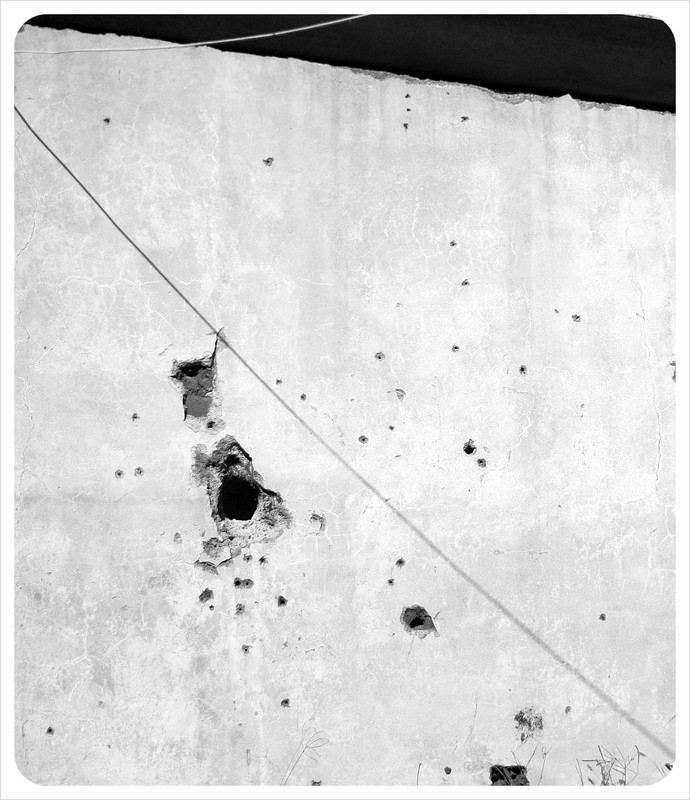 The soldiers inside, in their underwear and brushing their teeth, didn’t seem to be guarding much at all, though the bullet holes blasted into the cement on the side were reminders of the long-term civil war which ravished the country from 1979 – 1992. Just past the guard station, the path abruptly ended. 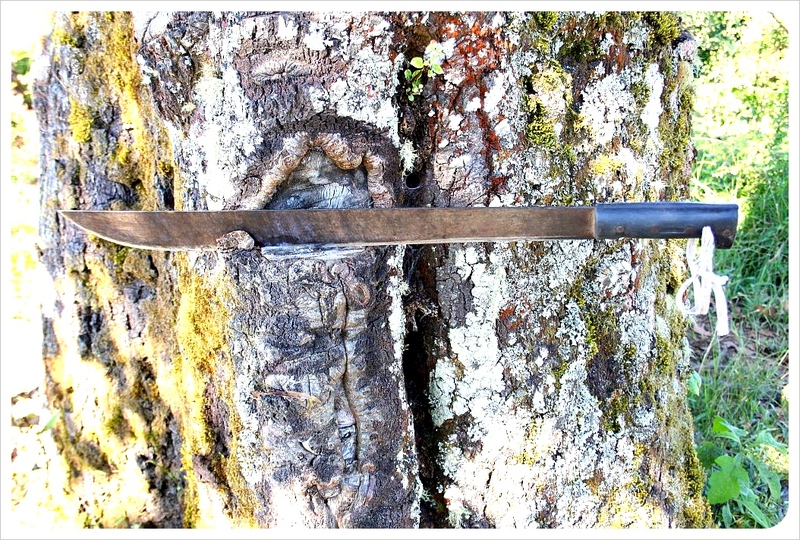 Had I asked about what the machete was actually for before we set off, we would have learned that we were the first hikers to do the walk after the winter rainy season, and that the path had disappeared under branches, trees, and overgrown plants. Walter began hacking his way through the bushes and branches, magically following a path which the three of us did not see. Luckily, we didn’t find out until after the hike that the area was filled with scorpions, snakes and other little critters. Suddenly, instead of solid ground, we were confronted with boulders piled up in front of us, and the only way to go was to hop and scramble from boulder to boulder like professional rock climbers – or Super Mario Brothers. Good thing we chose to wear our hiking shoes that morning. What had been a fairly easy hike had now turned in to a mountaineering session, with Walter holding our hands as we ascended and descended with one hand, while whacking at thick branches and tangled bushes in front of him with the other. 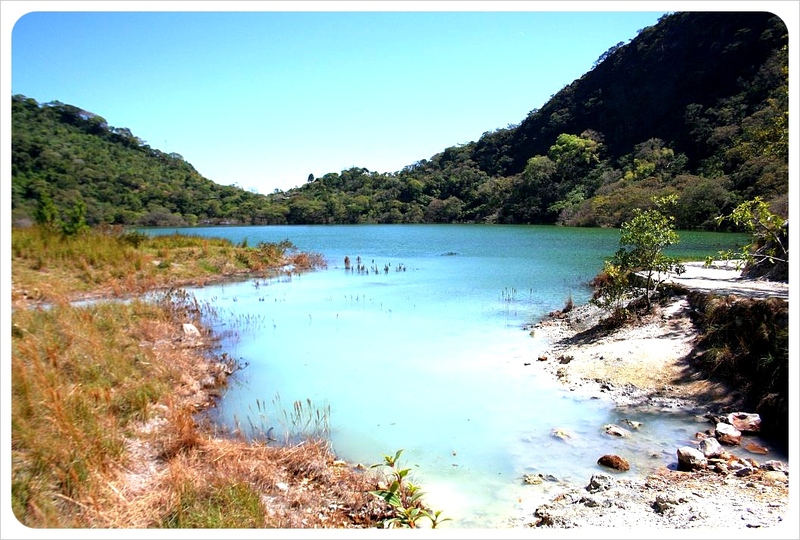 Finally, after five strenuous hours and a steep slippery gravel descent, we took in the smell of the sulfur lake while eating bananas and taking a very well-deserved break. On our return to town we took a different path, through a private coffee plantation, past workers collecting beans and children picking and crushing walnuts to share with us. Though we never intended on becoming mountaineers, we both felt sure, as we nibbled our walnuts, that the adventure was well worth the challenge. El Salvador does not have a variety of street food, especially dearth are the vegetarian street food options. In fact there is really only one, single type of street food worth eating in El Salvador: The Pupusa. These magical little filled dough pancakes more than make up for the lack of options. Pupusas are like very thick corn tortillas are stuffed with the below ingredients and flattened down by hand before being heated on the grill. Pupusas are on every menu in every restaurant, but it’s best to belly up to a table at a pupuseria, which is a very local restaurant dedicated entirely to serving up steaming hot pupusas. No hemming and hawing over what to eat, no menu to peruse. Instead, just walk in, indicate how many of which type of pupusa you want and enjoy a cool beer while you wait. There is even a special flat grill dedicated to pupusa-making which is for sale in every appliance/home store in El Salvador. 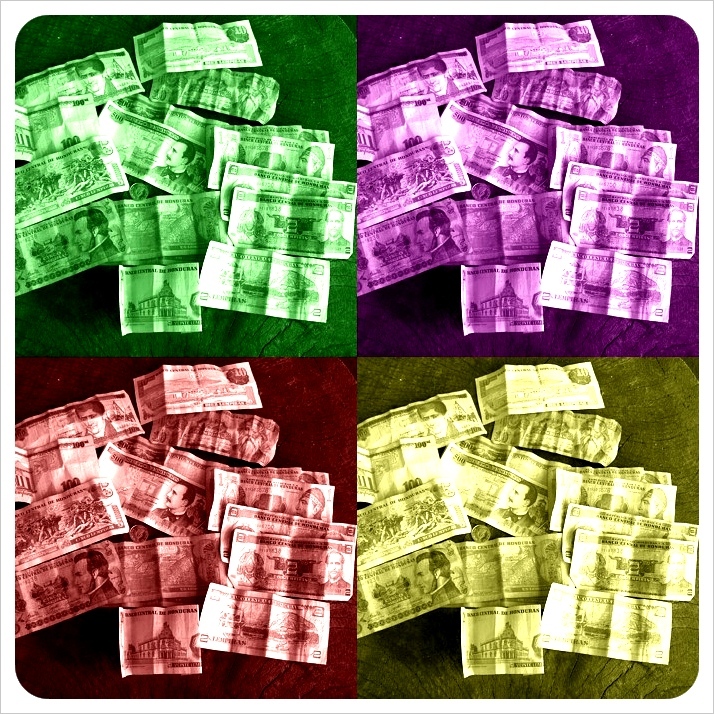 We considered shipping costs for one of these more than once, but alas, to what home would we send it? Once your stack of pupusas has arrived, top them with curtido, a pickled cabbage salad similar to coleslaw bur marinated in vinegar (actually tasty!) and pour on a medium hot red salsa. The ingredients can vary slightly, but are almost always identical. In El Salvador, the default dough is made from corn, but there is also a rice dough version. Stick with corn, we advise, unless you – like us – gorge so often on pupusas that you really need the change up. Should you ever find yourself hungry on a bus in El Salvador, do not worry, as waves of women with baskets or trays of pupusas will constantly jump aboard and squeeze and shimmy towards you squealing ‘puuuupuuuussaaaaas”. Not only have the Salvadorians dedicated an entire type of restaurant to these delicious doughy disks, they have also dedicated an entire day to honor them: National Pupusa Day on November 13th. We were lucky enough to be in El Salvador on this holy celebration. 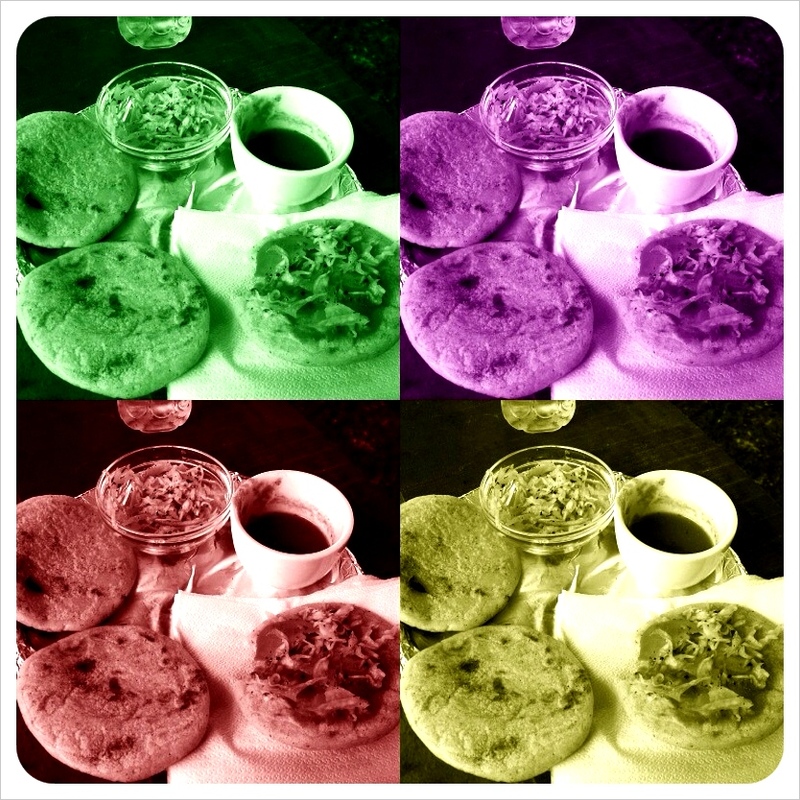 However, because we took to downing 3-4 at least once a day, every day we spent in El Salvador was our Pupusa Day. The best part about pupusas is that they are not only tasty, they are cheap, varying between 25 cents and 50 cents depending on where you get them. The best price meets best quality at about 40 cents per pupusa. Even the biggest eaters need no more than four to fill up, which means lunch or dinner for around $1.60. 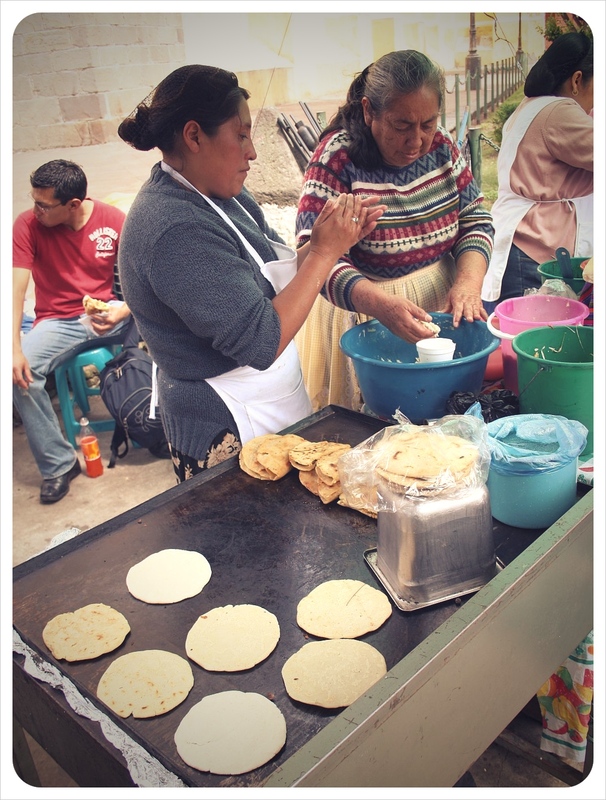 Throughout Central America you will see street food stands with ladies preparing pupusas, and there is usually at least one pupuseria in any medium-sized city. In Guatemala they were too large, and the cheese was decidedly not delicious. In Honduras they were lackluster; their makers were not dedicated to art of the pupusa. Salvadoran pupusas are definitely the best, with just the right amount of dough combined with a much more delicious cheese, called Loroco, than found in other Central America countries. Tip: We had our best Pupusas at a professional pupuseria in the small mountain town of Alegria. 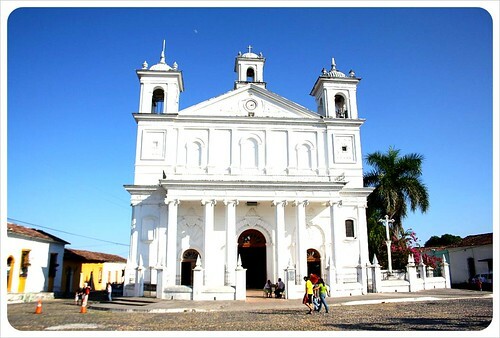 Next best were the two stands nearest the church on the central square in Suchitoto. The pupuseria next to the café had the best rice pupusas we sampled while in El Salvador. An amazing year is coming to an end – our first as full-time travelers! Rather than rattle off a list of everywhere we’ve been, check out our year in pictures, from the pre-trip ‘planning’ phase to the rather unexpected place where we are ringing in the New Year! In January we made the semi-spontaneous decision to become digital nomads and to leave London, where we had been living since 2007. In February, we packed up our apartment and Dani drove a few boxes to her hometown of Erfurt in Germany, where she stored our stuff and said goodbye to friends and family. Jess did the same in March, home in chilly Chicago. 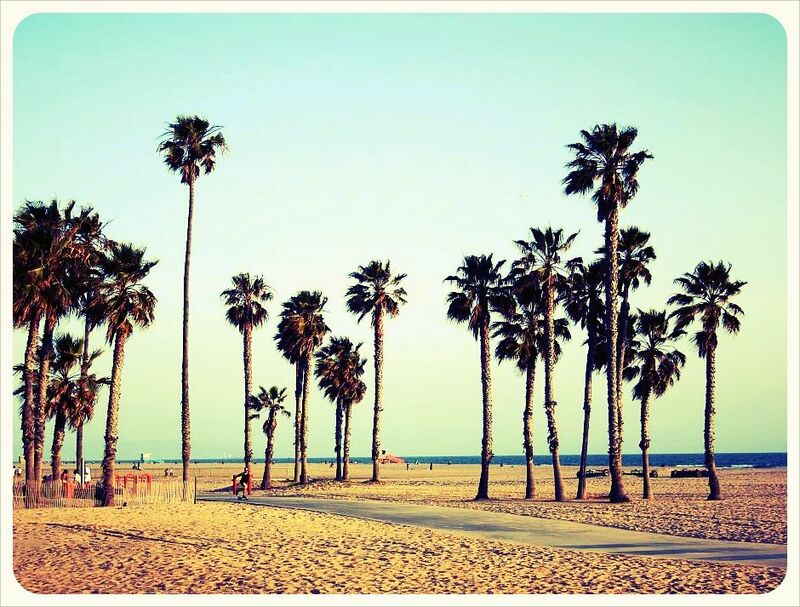 …before heading to San Francisco up the Pacific Coast Highway in May, the first of many road trips to come. June saw us exploring the Arizona desert during our Tucson house-sit, then the canyons (Antelope, Canyon de Chelly and the Grand Canyon) in the north during one last road trip in the U.S.
…and from there we flew into Mexico City, where we started our Mexican adventure. 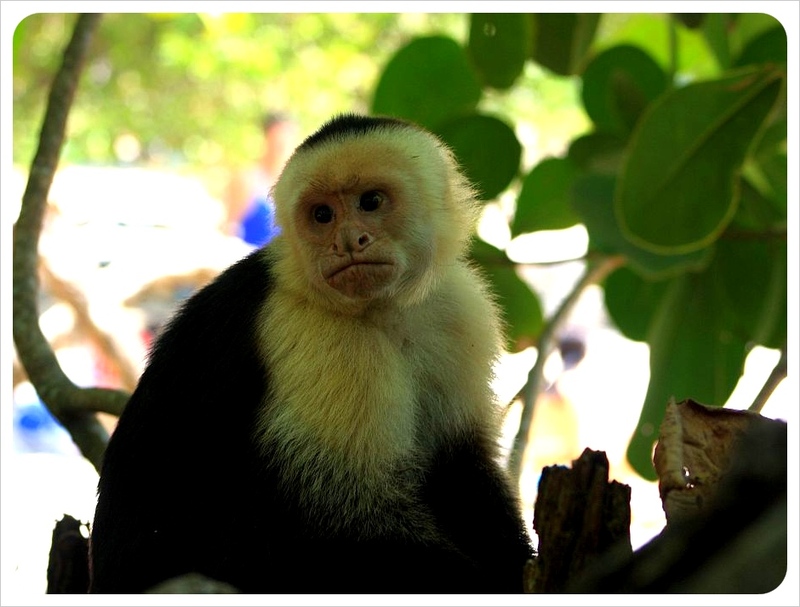 We spent August exploring Southern Mexico from Oaxaca to the Pacific Coast, San Cristobal, Palenque and the Yucatan. …and in October we began our two-month tour of Guatemala, which included Mayan villages, market towns, volcano climbing, the colonial town of Antigua and Lake Atitlan. In November, we took a 2-week detour to El Salvador, where we found some rough Pacific beaches, hiked a volcano crater and visited colonial towns like Suchitoto (pictured) and those on the Ruta de las Flores. In December, we headed to Honduras, where we finished the ‘Maya trail’ by visiting the last of the series of Maya ruins at Copan. We’re ringing in the New Year at Lake Yojoa, before heading to Nicaragua to start of 2011! Happy travels to all fellow travelers and happy New Year to all our readers out there!